Dr. Brian Tse (pronounced 'see') is one of a new crop of young physicians who have settled in Port Perry recently to begin a career in medicine. When asked about his decision to become a doctor, even he admits, "Sometimes I wonder." But on thinking about it, he believes it was probably positive experiences with his own doctor growing up, that led him in that direction. Showing a sense of humour, Dr. Tse candidly confesses, "I was too clumsy to work with my hands, wasn't creative enough to pursue the arts, and just didn't understand politics and business!" Having been born and raised in Markham and North York, it's not surprising that the University of Toronto would be his choice for further schooling. After graduating he attended the University of Western Ontario and then returned to Toronto for his internship. 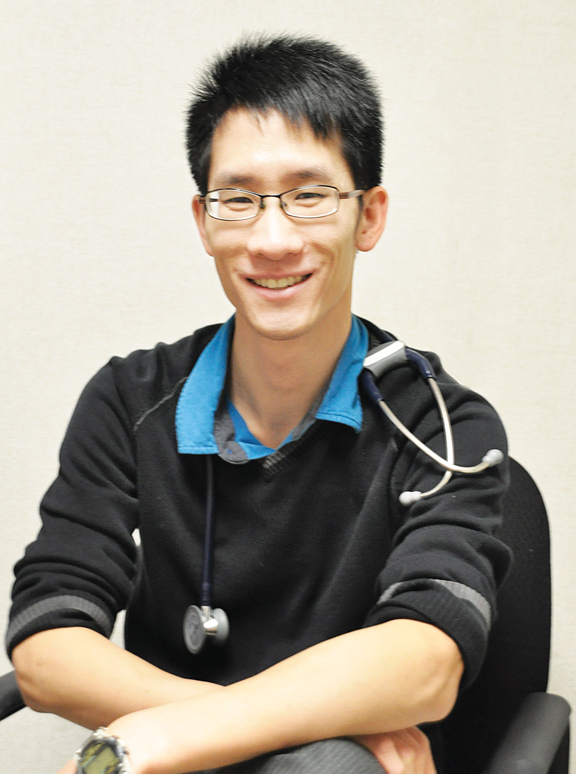 It was during his internship that Dr. Tse first came to Port Perry as part of the "Internship in Family Medicine" program. "The U of T has a sort of hybrid 'rural' Family Medicine program, with the first year spent at a community hospital in Toronto/East York for me, and the second year entirely in an affiliated community", he explains, Port Perry being one of those communities. It wasn't long into his year of interning in Port Perry that Dr. Tse began to understand the advantages of practicing in a small, rural community. "I got the sense, which everyone likely does when they come here, of warmth, camaraderie, support, pleasantness, combined with good people and beautiful scenery. It's not everywhere you can find such a conglomerate of positives," he says with his trademark smile. Having been in Port Perry only since last July, Dr. Tse has yet to get a handle on what attracted him back to Port Perry after his graduation, but speculates it was the friendly and easy-going style of life and the many opportunities for activities and the outdoors. And when it comes to his free time – when he's not in his office treating patients – Dr. Tse enjoys a host of other sporting activities, including soccer, tennis, badminton, softball, skiing, snowboarding, rock-climbing, hiking, golf and anything else physical. He also admits to being a "Leafs" fan and said if they were playing better, he'd probably enjoy watching them more! Living and working in a small community can have both its advantages and disadvantages but Dr. Tse takes it all in stride. He's pleased that the residents of the community are generally respectful of his privacy and personal time. He finds that practicing in a smaller medical group and hospital provides a wider variety of opportunities. He explains, "in a larger centre, there is usually more specialization of service; whereas here, the family doctors work in the hospital, see patients who are admitted, do deliveries, etc. Also, everything is close by, people seem friendlier, there is a greater sense of community, and there is less traffic". If there is any disadvantage, he feels it would be less on-site access to resources, such as a CT scan, intensive care unit, and specialists, such as orthopedic surgeons. Like all medical practitioners, balancing his workload with his personal life – he's single but has a girlfriend – is not always easy. "I find this a constant struggle, but it helps to have such supportive and understanding family and colleagues" he says. "One of the many great things about the group (Medical Associates of Port Perry), is that everyone tries to help each other out, and ensure we all get time off unimpeded for family time and obligations". So as he begins his career in medicine here in Port Perry, Dr. Tse looks ahead with anticipation – hoping that he can make positive changes in the lives of his patients – the same as his pediatrician did for him when he was a young lad growing up.